E-commerce specialist Wayfair (NYSE:W) lagged the market last month by falling 25% compared to a 7% slump in the S&P 500, according to data provided by S&P Global Market Intelligence. The decline occurred during a brutal period for most stocks, especially technology companies that had previously enjoyed sharp rallies. 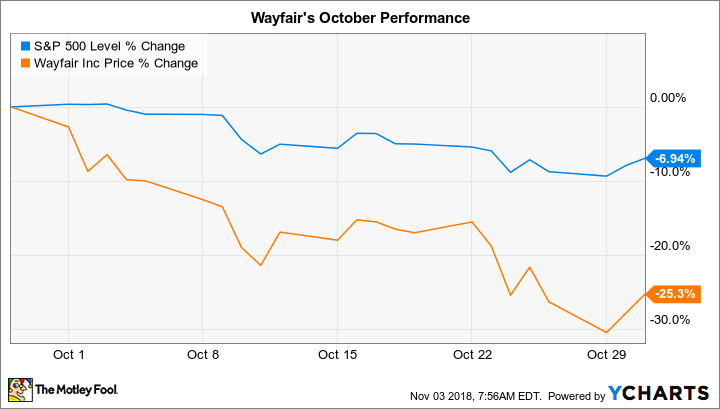 Wayfair had been up nearly 90%, in fact, but October's drop pushed those returns closer to 30%. Beyond the generally negative market sentiment, investors also sold the stock lower in anticipation of tough third-quarter earnings results. The concerns turned out to be well founded, since Wayfair on Nov. 1 revealed that its losses roughly doubled as costs spiked. Sales growth remained healthy, on the other hand, and exceeded management's guidance for the third straight quarter. Investors can expect costs to remain elevated as management prioritizes investing in the business. They are ramping up hiring and spending on infrastructure and advertising right now, for example, because they see an attractive opportunity to secure high returns over the long term. Meanwhile, Wayfair issued a conservative forecast for the holiday season as executives prepare to match prices with traditional retailers who might resort to aggressive discounting over the next few weeks.